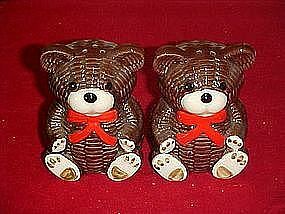 Hand painted glazed ceramic teddy bears with cold paint accents. They measure 3 1/2" tall and have plastic stoppers. They are cute, and have the appearance of woven wicker. Foil stickers OMC Japan. Perfect condition.